Review: Ant-Man & The Wasp (2018) The Fun, Lighthearted, Live-Action Superhero Movie You’ve Been Looking For All Year. 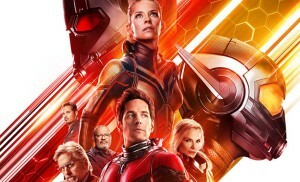 Peyton Reed returns to helm the sequel to 2015’s Ant-Man, a family driven superhero film in the vein of The Incredibles that is incredibly satisfying to watch and smart about keeping its stakes relatable. The biggest problem most tentpole superhero films make out of the gate in emphasizing the wrong things in a sophomore attempt. More CGI, multiple villains being the focus of the film’s thrust and characterization while throwing the protagonist more gadgets and a new outfit tend to be the usual suspects that drag sequels down to their eventual fate in a Walmart $5 dollar bin. Thankfully, Ant-Man and The Wasp manages to avoid those cliches for the most part by focusing on what worked in the first film; a character driven plot with relatable stakes for the characters and the audience. This isn’t a film that is interested in a doomsday apocalypse revolving around a floating circle of trash projected froma skyscraper. It’s a film about a father who made the right decision in helping Capatin America in Civil War and paid a heavy price for it; 2 years of house arrest followed by probation. As we rejoin Paul Rudd’s Scott Lang, the FBI agent assigned to his case, played to great comic relief as an awkward straight man by Fresh Off The Boat and The Interview’s Randall Park, reminds Scott that he has 3 days left til he’s freed from house arrest and he’s forbidden from contacting Hank Pym (Michael Douglas) and Hope Van Dyne (Evangeline Lily), who are wanted for violating the Sokovia Accords by providing Scott with Ant-Man tech. Just as the time is almost up, Scott is jolted by a vision where he possesses the body of Janet Van Dyne (Michelle Pffiefer) and he contacts Pym, who kidnap him and inform him they’ve built a bridge to the quantum dimension that Scott has been contacted through. Along the way, Scott has to help his buddy Luis (Michael Pena) with their new security business, outwit a black market tech dealer (Walton Goggins) and a literal Ghost (Hannah John-Kamen) that is chasing the Pyms for access to their quantum technology. The less you know about the film going in the more you will enjoy it, but it is a delight. Its the type of movie The Wolverine should have been, with a grounded plot that affects the motivations and relationships of characters weve grown to care for with real stakes to their freedom and relationships. The film is straight out of the mold of Disney animated fare like Big Hero 6 or The Incredibles, a fun family superhero film with characters you can get behind and an antagonist whose point of view isn’t alien to our own. The humor is on point and continues the Marvel formula of letting good performances and comedy drive a fun film versus making something dour. Highly recommended.